You can add as much content as you want or even leave the event empty for now. The event will be instantly published to the Attendify app and you'll be able to update the content after. 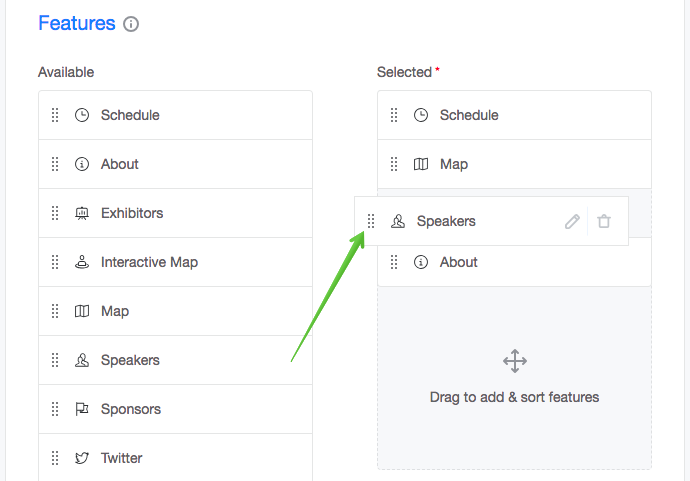 In order for the app to be approved by App Store and Google Play, you should include at least 4 features (for example, "About", "Speakers", "Schedule", "Sponsors") with at least 3-4 items in each feature (at least 3 speakers, 3-4 scheduled sessions for each day of the schedule, etc). Please, make sure not to leave any features empty or include generic names of features/content ("Test", "Speaker 1", "Sample session" etc). In Step 2 (Content) you can fill in the information that you have for those features, such as your speaker profiles, scheduled sessions, etc. Remember, you need at least 4 items (sessions, speakers, etc.) within each feature. 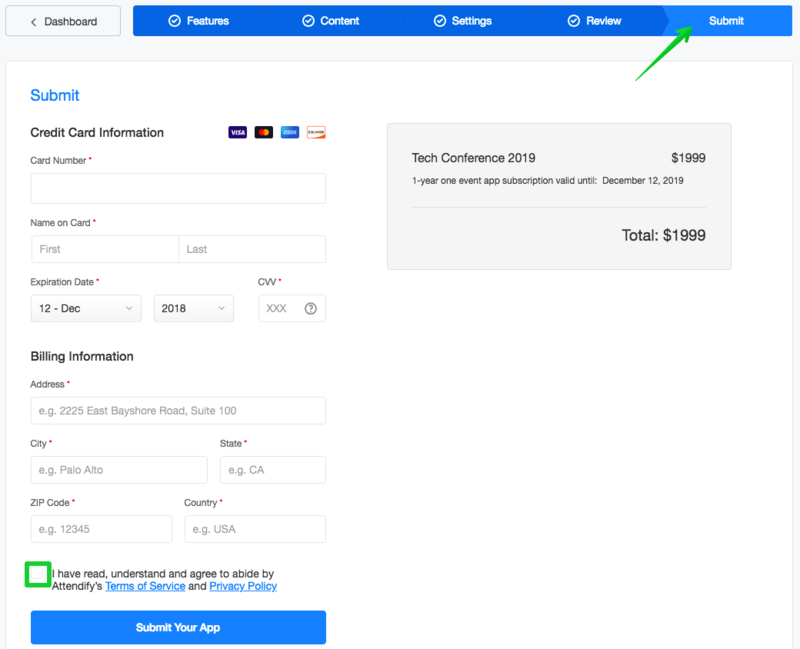 Step 3 (Settings) includes App Markets related details such as App Name & Description, Icon & Icon Label that will appear on the App Markets and optional Splash screens, Attendee List options and WebApp password protection. Please, note that in order to change the Icon, Icon label, Description or Splash screen we would have to resubmit your app to App Stores which involves a $199 payment and can take up to 2-3 weeks as the app would need to pass another review on App Markets. Access management settings can be updated at any time after the app is published. The same rules apply as for the one event app - you should include at least 4 features (for example, "About", "Companies", "Staff", "Map") with at least 3-4 items in each feature (at least 3 staff members, 3-4 companies/partners, etc) in order for the app to be approved by App Store and Google Play. 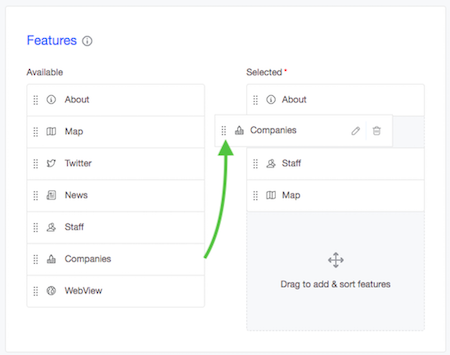 Please, make sure not to leave any features empty or include generic names of features/content ("Test", "Staff 1", "Sample Company" etc). You can add features in the Features section. 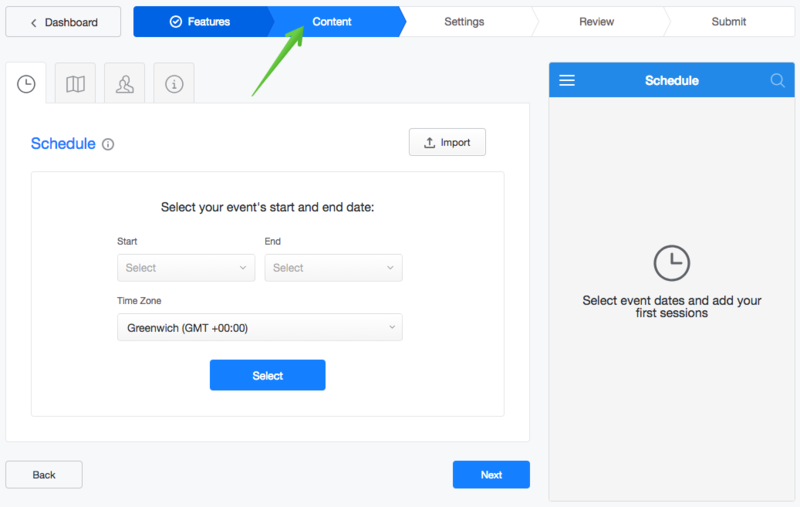 We also recommend you publishing at least one event within along with the container and filling it in with some content.